The NFL wanted more scoring and more offense. It got more scoring and more offense. The 4,489 points scored through Week 6 are the most in NFL history to this point in the season. Teams have combined to score 504 total touchdowns, with an average of 48.1 points per game. There have already been an incredible 328 touchdown passes, an average of 55 per week. Offenses are generally further ahead than the defenses early in the season. And the weather is going to play a factor as the season wears on into the winter. But for the most part, this is the new reality of the NFL. And the league has turned itself into some amalgamation of Big 12 football and the Arena League. Interestingly, the increase in scoring has resulted in more blowouts. In fact, it is just the opposite. The current average margin of victory of 9.96 points per game is on pace to be the lowest in professional football in nearly 90 years. This lower margin of victory isn't, as some would lead you to believe, an indicator in increased parity in the NFL. There is still clearly a top tier and a bottom tier in this league. And outright upsets aren't any more common now than any other season. Favorites are still winning outright nearly 70 percent of the time in NFL games, in line with some historical norms. The books have already adjusted. And underdogs aren't any more valuable now than they have been in the past. To this point in the season the underdogs have covered the spread in about 53.5 percent of all games. That's higher than last year, which was particularly good for favorites, but in line with what we've seen underdogs accomplish in the past. Historically, the spread only comes into play around 20 percent of the time. That means that only 80 percent of the time the team that wins the game covers the spread. So far this season there have been 93 games 20 instances where a team lost (or tied) and covered the spread because of the number. That's a 21.5 percent conversion rate and perfectly in tune with what we've seen in the past. Further, the 'over' has hit in 51 of 93 games so far this season. That's a 54.8 percent success rate on the 'over'. However, seven of those wins were in the nine overtimes games. That means that games that end in regulation have gone 'over' just 52.4 percent of the time. And given the astronomical scoring outbursts we've seen, that's a pretty solid testament to how aggressive the sportsbooks have been in adapting to higher-scoring games with much higher totals. 1. 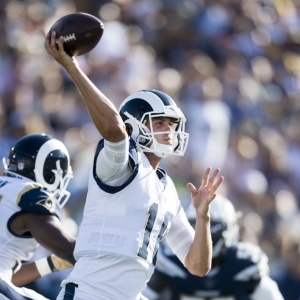 Los Angeles Rams (5-0) - San Francisco has had the Rams' number over the last several years, with Los Angeles (erstwhile St. Louis) going just 2-8 ATS against the 49ers. The Rams have failed to cover the spread in the last five meetings, and this has been a healthy underdog series for more than a decade. 2. New England Patriots (4-2) - Bill Belichick and the Patriots defense prepared for the Chiefs offense last week. Now they have the benefit of facing a Bears offense that does a lot of the same things, given that Chicago head coach Matt Nagy was the offensive coordinator in Kansas City last season. 3. Kansas City Chiefs (5-1) - The Chiefs have covered every spread that they've faced this season, sneaking in a back-door cover against New England last week despite being outgained for the fifth time in six weeks. 4. New Orleans Saints (4-1) - I think the bye week will have blunted any momentum that the Saints had coming out of their peak effort against the Redskins on Monday Night Football. The Saints are 9-1 ATS in their last 10 games after a bye week, though, and 16-5 ATS in their last 21 road games. 5. Baltimore Ravens (4-2) - That was a dominating defensive effort from the Ravens last week in Nashville, posting 11 sacks against the overmatched Titans. Baltimore has played three straight - and four of its last five - on the road. With four of their next five at home, this team has a great chance to put the AFC North lead in a choke hold. 6. Minnesota Vikings (3-2-1) - Attrition continues to sneak up on the Vikings, who lost cornerback Mike Hughes for the season last week and will likely play the rest of the year without Everson Griffin. The Vikings are going to be one of the most popular bets of the weekend, with 75 percent of the action coming in on them against a short three-point line versus the Jets. Minnesota is 7-3 ATS on the road and 45-21 ATS in their last 66 games. 7. Los Angeles Chargers (4-2) - Because this week's trip to London counts as a "home" game for Los Angeles, the Chargers will go 41 days in between true home games this season. The Chargers are practicing in Cleveland this week before crossing the pond, and it will be interesting to see if that throws off their mojo after winning 11 of 15 games. 8. Pittsburgh Steelers (3-2-1) - Honestly, do the Steelers even want Le'Veon Bell back? I understand that he's a great player. But right now he is a malcontent, and there is no love lost between him and some of the guys that have been trashing him during his holdout. I think they should just put him on IR and let him walk. It is a bad karmic move to bring him back. 9. Philadelphia Eagles (3-3) - Last year the Eagles gutted out a 28-23 road win over the Panthers, turning 310 yards into 28 points thanks in no small part to Cam Newton's three interceptions. The favorite is 4-1 ATS in the last five meetings, and the Eagles are 5-2 ATS in their last seven against Carolina. 10. Carolina Panthers (3-2) - D.J. Moore will have better days than that, with his two early fumbles directly leading to 10 points. But the fact that the Panthers have to rely on the rookie wideout at all shows just how thin the talent at the skill positions is. The Panthers are 5-0 ATS after a loss and 10-4 ATS after failing to cover the spread. 11. Cincinnati Bengals (4-2) - I still think that this team is a bit of a fraud. They have been outgained on the season, and their 12.1 yards per point is completely unsustainable. 12. Chicago Bears (3-2) - Do not buy into the statistical love that Mitch Trubisky is getting right now after back-to-back 300-yard games. That Miami loss was 100 percent on his shoulders. His end zone interception, on first-and-goal no less, is unforgiveable. If the Bears had simply ran the ball three times and kicked the field goal, they would've been up 11 with less than 10 minutes left against a Dolphins team that had scored just 13 points in the first 50 minutes of the game. 13. Jacksonville Jaguars (3-3) - The Jaguars have allowed 29 first downs, 800 total yards and 70 points in the last two weeks. But the bigger problem is still the offense, which is averaging just 18.2 points per game. Further, the Jaguars finished the regular season +10 in turnovers last year, and they are -9 through six weeks this year. 14. Green Bay Packers (3-2-1) - These guys are weak. Once again, Aaron Rodgers is propping up one of the worst rosters in the NFL. 15. Washington Redskins (3-2) - This Sunday has to be one of the biggest regular-season games the Redskins have played in Washington this decade. They can take control of the division with a win over rival Dallas this week. 16. Miami Dolphins (4-2) - There is no way the Dolphins should've won that game over the Bears last week. None. And if Brock Osweiler is forced into action for any extended period of time, then these guys are in trouble. Miami is facing its second straight opponent that is off a bye this week. 17. Detroit Lions (2-3) - I'm not exactly optimistic that rookie coach Matt Patricia utilized the bye week to come up with something brilliant on offense or defense for the Lions. His best hope is that Matt Stafford takes care of the ball this week and the Lions defense can patently harass Brock Osweiler this week. The Lions are just 2-9 ATS in their last 11 games against a team with a winning record and just 7-20 ATS after scoring 30 or more points. 18. Cleveland Browns (2-3-1) - Someone needs to explain to Baker Mayfield that throwing the ball away is preferable to taking sacks by the handful. At one point last week Cleveland had five straight drives into Los Angeles territory result in just three points. Some of that was terrible execution by Mayfield, some of it was horrendous play calling by Todd Haley, and some was just classic incompetence from Hue Jackson. The Browns brain trust really had a banner day. 19. Dallas Cowboys (3-3) - The road team is 7-1 ATS in the Redskins series and Dallas has covered the spread in four straight trips to Washington. The Cowboys are 5-2 ATS in their last seven games against the Redskins and the underdog is an incredible 30-10 ATS in this series, although most of those underdog covers came via Washington. 20. Denver Broncos (2-4) - It's pretty impressive how bad John Elway is at scouting quarterback talent. Case Keenum is 21st in yards per attempt, 28 th in passer rating and tied for the league lead with eight interceptions. The Broncos are 9-2 ATS in their last 11 Thursday games, but they are just 7-19 ATS in their last 26 games overall and they are just 3-13 ATS in their last 16 road games. 21. Tennessee Titans (3-3) - The Titans are 6-2 ATS following a loss, and they are 9-3 ATS in their last 12 games against a team with a winning record. However, they are 19-44 ATS in their last 63 games against AFC opponents, and they are 0-10 ATS in their last 10 games against the Chargers. 22. Atlanta Falcons (2-4) - If there had been 20 more seconds in that game on Sunday, the Falcons would've lost. Atlanta just continues to get savaged by injuries, with Devonta Freeman done for the year, Calvin Ridley and Mohamed Sanu banged up, and Matt Bryant out for at least a week after last week's win over the Bucs. Atlanta is 5-1 ATS on Monday Night Football but this team's roster has been decimated. 23. Seattle Seahawks (3-3) - That was a brilliant throw and catch by Russell Wilson to David Moore for Seattle's second touchdown. Wilson had plenty of time to survey the field, but that score essentially ended the game early in the second quarter. 24. Tampa Bay Buccaneers (2-3) - Mike Smith, the highest-paid defensive coordinator in the NFL, was fired after last Sunday's effort. That game against Atlanta marked the 20 th time in 37 games that Smith's defense allowed an opponent to gain at least 400 yards. 25. Houston Texans (3-3) - I'm shuddering thinking about the pounding that Deshaun Watson is going to take this week against the Jaguars front seven. Houston has won three games in a row. But let's slow down a bit. Two of those wins were in overtime and were gifted to the Texans thanks to egregious coaching errors by their opponents. The third win was over Buffalo thanks to the colossally incompetent Nathan Peterman. Three of Houston's last four games have come against opponents that are currently 1-5. They were outgained in two of those games and could very easily have gone 0-3 in them. Do not even think about jumping back on this team's bandwagon. 26. New York Jets (3-3) - After being thrown to the wolves with three games in 11 days to start the season, Sam Darnold has started to settle in for the Jets. However, the Jets are benefitting more from the 15 takeaways that their defense has generated (No. 2 in the NFL) than they are from Darnold. New York's 12 giveaways on offense are the fourth-most in the league. 27. San Francisco 49ers (1-5) - I still don't think I'm wrong about C.J. Beathard when I say that he is not an NFL-caliber quarterback. Instead, I think that Beathard's success is just the latest in a long line of examples as to the greatness of the Shanahan-Kubiak offense, which has been one of the most success offensive systems of the last 25 years. 28. Oakland Raiders (1-5) - I still cannot believe that there was no penalty on the Amari Cooper hit. The officials must've called the helmet rule a dozen times a game in the preseason. All we heard about was how NFL officials are going to be calling that rule in the regular season in an attempt to promote player safety. That was a goddamn textbooks example of what they said they wanted to take out of the game - and no flags. Just incredible. 29. Indianapolis Colts (1-5) - T.Y. Hilton is apparently the only receiver on the Colts roster that can actually, you know, catch. I know Andrew Luck can sail some balls. But the Colts have had 18 drops in the past three weeks. That they have managed to score 92 points in their last three games (all easily going 'over') despite those drops is a testament to Luck. 30. Buffalo Bills (2-4) - Nathan Peterman! I can't tell if he is just the greatest quarterback I've ever seen or if he is actually the greatest quarterback in world history! Peterman has thrown 70 passes in his two-year NFL career. Nine of them (11.4 percent) have been intercepted! That means that if he attempted 600 passes in a season he would throw roughly 69 interceptions. Amazing. The Bills are actually going to start Derek Anderson, a guy that they've had on the roster for 15 minutes and who hasn't been a regular starter since 2010, rather than give Peterman another shot. I have no idea how Nathan Peterman is still on an NFL roster at this very moment. He's the best. 31. New York Giants (1-5) - If the Giants were smart, they would dangle something in front of Denver and try to take Case Keenum off their hands. New York is just 2-5 ATS in its last seven games on Monday Night Football and they are 3-9 ATS in their last 12 games against conference opponents. The road team in this series is 9-3 ATS and the Giants are 14-7 ATS following a double-digit home loss. 32. Arizona Cardinals (1-5) - Arizona has yet to muster more than 300 total yards in a game, and they have been the worst third-down team in the NFL this year, converting just 22 percent of their opportunities. They were 0-for-10 on third down against Minnesota yet somehow still managed to cover the spread. Throughout the season I will have my NFL Power Rankings every Tuesday. My next ones will be released on Tuesday, Oct. 23.